Quality Hand Soaps that play SOUND! 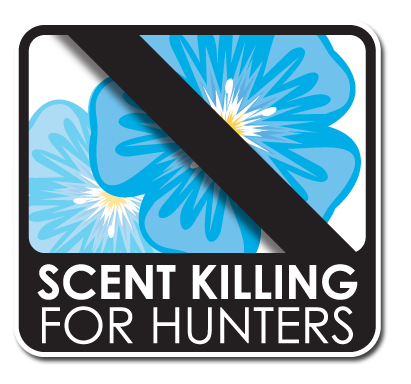 We safety test all of our product, but NEVER on animals. Our soap includes moisturizers like Aloe Vera to nurture your skin. 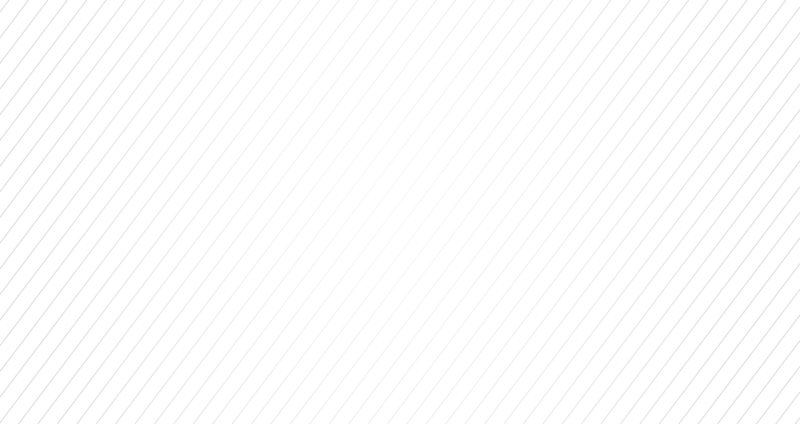 We employ disabled workers to assemble and package our product. 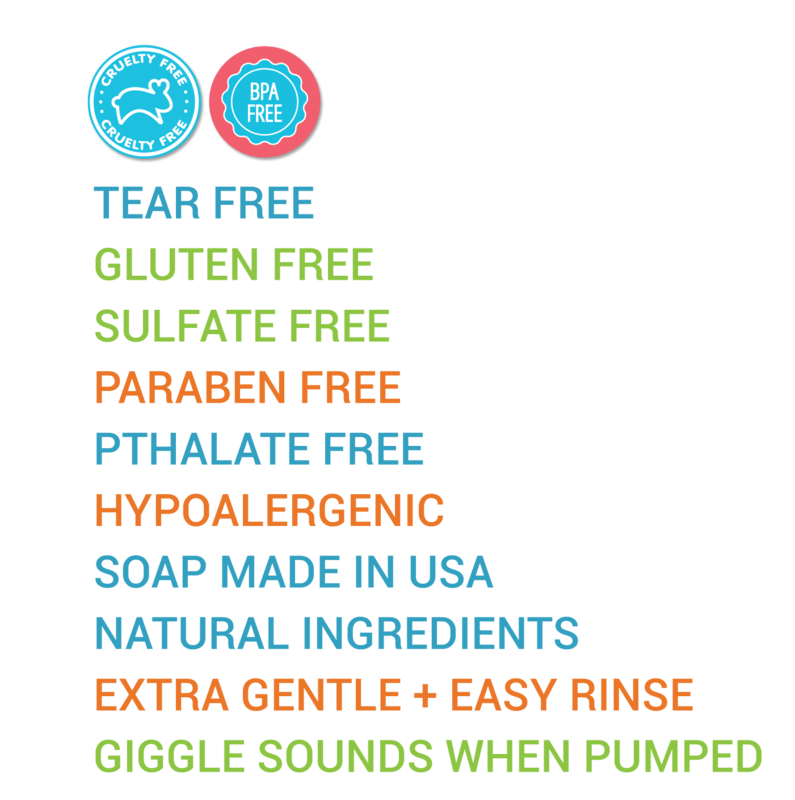 Our soaps use ingredients from the USA and are 100% produced in the USA. 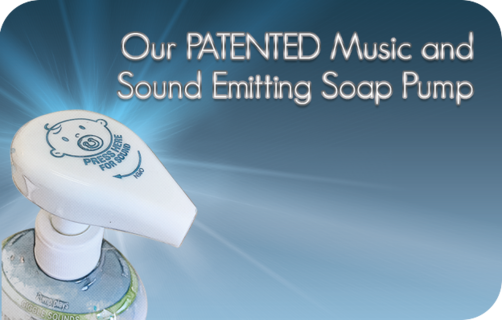 The patented Soap Soundz® Musical Pump Top plays SOUNDS and/or MUSIC each time it is pressed....don't be fooled by cheap imitations, buy the ORIGINAL MUSICAL HAND SOAP from Soap Soundz®. to HEAR the sounds that they make! 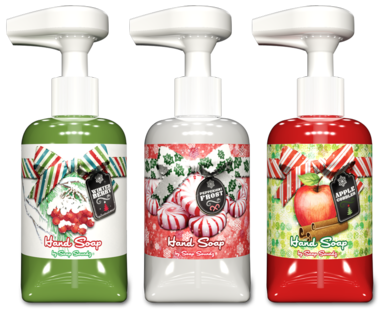 The Soap Soundz® Winter line combines the sumptuous scents of the Winter Holidays, with the tunes of the seasons to put everyone in the mood to enjoy the holidays! Enjoy Winterberry, Peppermint Frost, and Apple Cobbler scents this season while humming along to the classic songs of winter! The Soap Soundz® Halloween line combines the sweet scents of the Fall season, with the spooky sounds of Halloween for a playful and fun experience! Scare your friends with three different frightful sound clips while they wash with orange and candy corn scented soap! The Soap Soundz® Patriotic line combines fresh spring scents, with the songs that represent America and Freedom! Express your pride in the greatest country on earth. Perfect for decorating around Memorial Day, Veterans Day, 4th of July, or all year round! The Soap Soundz® Farm Friends line is a great way to teach young children to wash their hands properly and effectively. Playful animal noises are played each time the pump is pressed which will encourage kids to wash each and every time they use the bathroom! 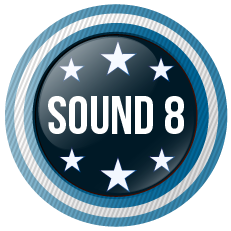 The Soap Soundz® Hanukkah line combines the wondrous classic songs of Hanukkah, with traditional colors and graphics to bring the spirit of holidays to your home. 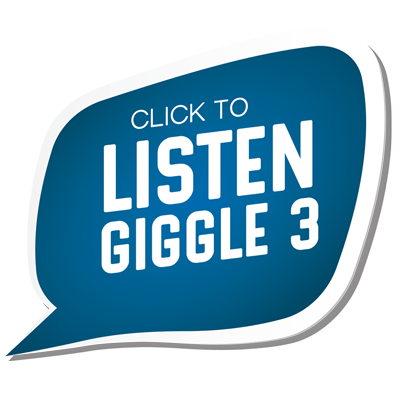 Make your friends smile with pride when they hear these beautiful songs. 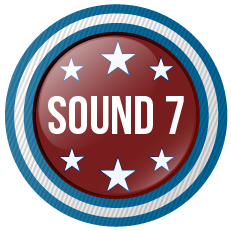 The Soap Soundz® Earthtones line combines the unique scents of nature with the soothing sounds of a lush rain forest, a cool beach or a grassy meadow. Earthtones hand soaps will transport you to these wonder filled places each time you wash! 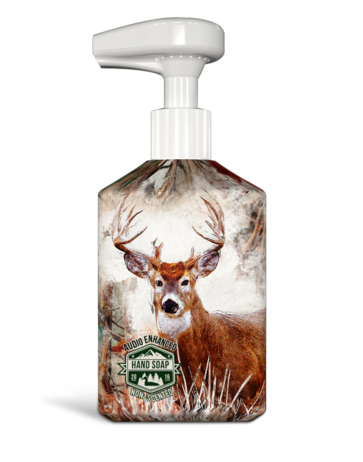 The Soap Soundz® Outdoor Sportsman line of hand soaps were developed for the millions of hunting & fishing enthusiasts. Each bottle comes with our patented sound enhanced pump complete with three hunting and fishing sounds. With each push of the pump, the user is taken back to their best hunt or day on the water with a fun hunting or fishing sound. 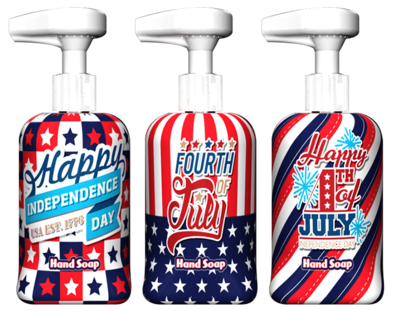 All of our quality hand soaps are made in the USA and are specially formulated to ELIMINATE SCENT. 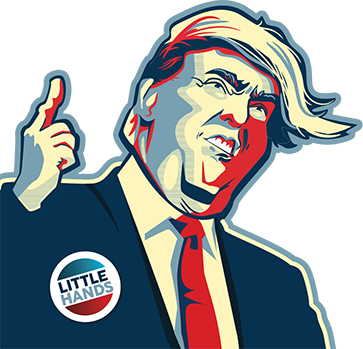 The Soap Soundz “Tiny Hand” Soaps are a hilarious addition to any bathroom or kitchen. Each pump plays EIGHT funny messages about hygiene and hand washing that will have everyone giggling with delight. 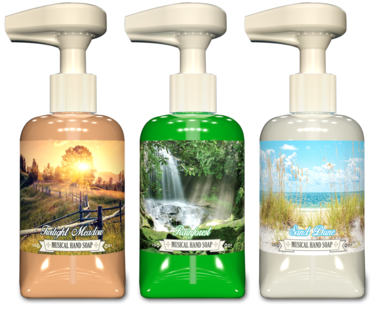 Each bottle comes complete with naturally derived hand soap, Patented pump top with batteries. Soap made in USA. Soap Soundz® name and logo are a registered trademark of International Product Solutions, Inc.